They are few against many. They are the last line of defense. They can’t ever win. They can’t afford to lose. This July, enter one of the most dangerous areas on Battleworld as Kieron Gillen and Felipe Andrade bring you SEIGE #1 – a brand new Secret Wars story of deadly proportions! Welcome to the Shield, the last line of defense against the hordes to the south of Battleworld. Zombie armies, Ultron robots primed only for death, and the Annihilation Wave. The Shield is the only thing that keeps them out. To patrol the Shield is to know fear, for your end could come at any moment. To man the Shield is to put your trust in the men and women standing beside you at the edge of the world. And to trust your leader. Because if you patrol the Shield – you answer to Abigail Brand. “Like Kieron’s iconic take on Loki, we’re looking to cause a bit of mischief with this book,” says series Editor Jake Thomas. “We’re putting all the wildest things we can think of into a canon, we’re firing that canon at a canvas, and we’re calling what hits that canvas ‘SIEGE’. And we’re giggling the whole time. Now Brand and her team – Lady Katherine Bishop, Leah of Hel, Magik, Leonardo Da Vinci, Miss America Chaves, the Endless Summers and Grimm – must stand alone against unstoppable darkness. Because if they fail – everything is lost. 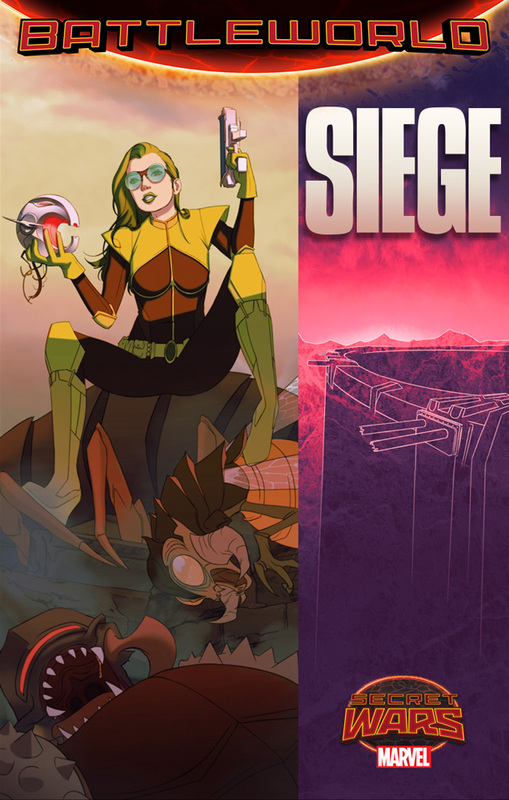 The valiant last stand of the unsung heroes of Battleworld begins this July in SEIGE #1! Next Article First teaser trailer for Ash vs. Evil Dead is here!